NoiseTutor is designed for rapid deployment with minimum effort. It eliminates frequent visits to remote locations; provides 'alert' notification by SMS / email; publishes real-time data at website; allows hearing of 'event' for noise identification; and with the optional outdoor microphone (PRM2103-FF) enables remote calibration checks and power saving by automatic humidity control. 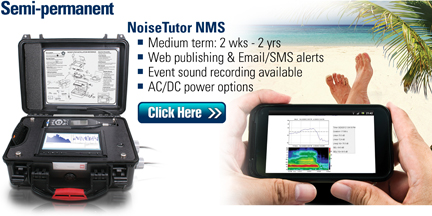 831-NMS is designed for long term noise monitoring. Weather station, battery, charger, 3G router etc can be integrated through the 831-INT-ET docking station to meet the customer's requirements. Two way remote communication is available for purposes of monitoring and control from a central station. 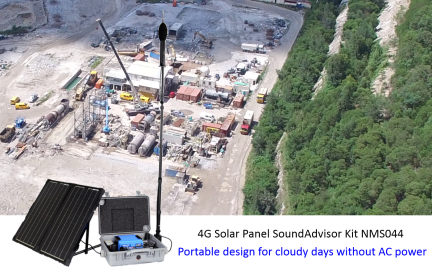 SoundExpert LxT NMS can be left at site for 2 weeks unattended noise monitoring. It uses the D-size batteries, so don't need to carry the heavy seal lead acid battery around. Data files can be transfered to the PC for reporting through USB cable or USB stick. 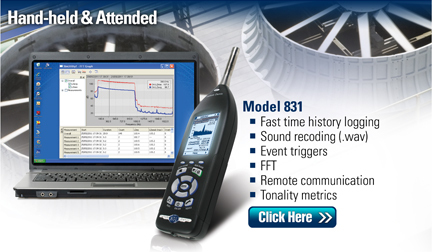 831 is an advanced class 1 sound level meter with extreme fast logging (down to 2.5 ms interval). 2 independent loggers are available for simultaneous data logging in 2 different time intervals (such as 1 min Leq/Ln and 30 min Leq/Ln). Through sound recording of event, noise source can be accurately identified. SoundExpert LxT is a cost effective class 1 sound level meter for attended noise monitoring. Data logging can be down to 1s interval. Another independent logger can be used for Ln / Leq logging with interval down to 1 minute.